Rafael Lozano-Hemmer - Project "Sitestepper"
Sitestepper is an Internet program that shows a 3D view of an apparently "neutral" living room. This space can be transformed automatically by scanning a website to extract its images, texts, colours and sounds. 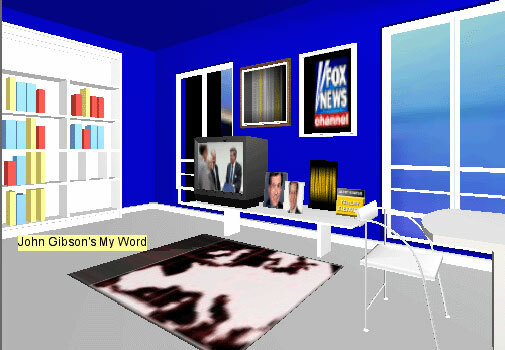 The system analyzes the contents of the submitted webpage and uses them to furnish and decorate the room, "branding" the space with a layer of live media. This project was commissioned for LA MOCA's digital gallery. Keywords: generator, interactive, networked, site-specific, indoor. LA MOCA (Digital Gallery), Los Angeles, California, United States, 2004. The artist would like to extend special thanks to Michael Lam, Lisa Mark, Rex Ravenelle, Alma Ruiz, Derek Spencer, and The Museum of Contemporary Art for making this project possible.